'Predictive policing' is a powerful new tool for law enforcement, but critics see big ethical problems. Editor’s note: NBC News MACH has partnered with the American Museum of Natural History to present three documentary films at the Margaret Mead Film Festival, which will be held in New York City from Oct. 19-22. In "Pre-Crime," filmmakers Monika Hielscher and Matthias Heeder examine the rise of predictive policing, which aims to stop crime before it occurs. The film led MACH to explore this new tool for law enforcement — its power and potential peril. We all know police officers respond to crimes after the fact. But what if cops could learn about crimes before they occur — and take steps to prevent them? That’s the promise of predictive policing, a high-tech approach to public safety that uses data about previous crimes to forecast new criminal acts. It's a bit like weather forecasting, only for crime: At the beginning of their shifts, officers review a map showing areas where crimes are expected to occur, based on arrest records and the dates and locations of recent crimes. The cops review the information and then head out on their beats, armed with information of where they should go at which times — and even who the bad guys are likely to be. If this scenario sounds like something ripped from some sci-fi novel, get this: Legal experts think predictive policing could go a step further, with law enforcement officers using brain scans and genetic information to identify children who seem likely to engage in criminal acts when they get older. Obviously, the technology raises thorny ethical questions. Ensuring that predictive policing algorithms enhance safety without worsening existing racial and socioeconomic biases will be difficult. The idea of forecasting crime dates back at least to the 1990s, when the U.S. Department of Justice launched projects aimed at developing statistical models of where crime might occur. The maps produced were crude — and because of limitations in computing power at the time, they were unable to handle large amounts of input data. 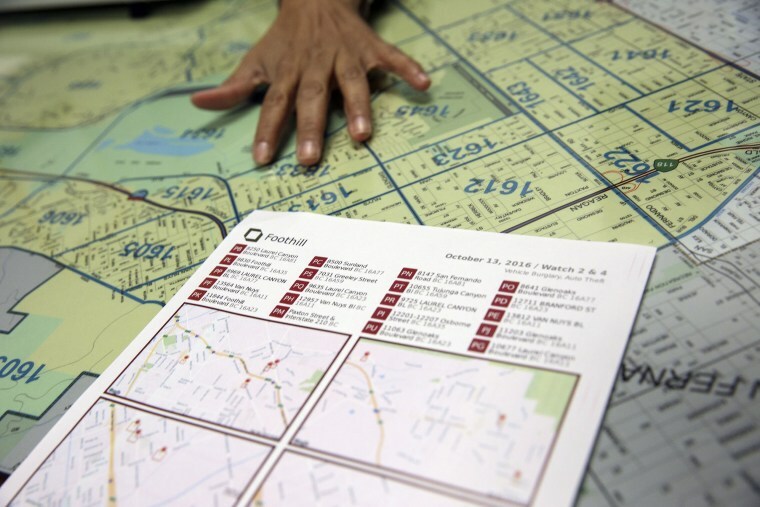 But the efforts led social scientists like University of California anthropologist Jeffrey Brantingham to think about spatial patterns of crime and equations that might help simulate such activity. The seeds of PredPol were sown in 2006, when Brantingham and his collaborators began building mathematical models to predict crime by borrowing equations from an unexpected source: geophysics. It turned out that the same math used to estimate a geographical region's odds of experiencing an earthquake could also be used to estimate whether a given location might see criminal activity. The forecasts are based on historical records. Just as an area that experienced an earthquake of a certain magnitude has specific odds of being shaken again, neighborhoods that have experienced a certain amount of crime are likely to have a predictable likelihood of crime in the future. Brantingham’s team partnered with the Los Angeles Police Department to run a controlled experiment to test their ideas. Officers in three districts in L.A. were given instructions to patrol 20 half-block areas based on predictions from either professional crime analysts or Brantingham’s algorithm. The results were striking. After 21 months, the mathematical model was pinpointing crime hotspots twice as accurately as the professionals, leading to a greater reduction in crime in places where it was used. The experiment showed the power of the crime-prediction algorithm, says Brantingham. Police might already be able to identify the first-, second-, and third-most crime-prone areas in their city, but could they definitively point to the ninth? Or the fifteenth? A computer’s calculations are often much better than personal experience or human intuition at determining whether it’s best to deploy officers to the seventeenth most crime-prone spot versus the eighteenth. Around the time PredPol was being developed, Daniel Neill, the Carnegie Mellon researcher, was working with his colleague Wilpen Gorr to tackle violent crime prediction using mathematical models borrowed from epidemiology. Both disease and crime tend to cluster in specific geographic areas, the researchers realized, and so it turns out that predicting the latter isn't too different from predicting the former. The research done by Neill and Gorr led to the development of a crime-predicting software tool known as CrimeScan. It uses historical crime data as well recent 911 calls and police reports of minor crimes like disorderly conduct, narcotics trafficking, and loitering to show where violent crime is likely to occur. CrimeScan was tried first in Chicago and is now being deployed in Pittsburgh, where police are running an experiment to test its effectiveness much like the one conducted for PredPol. Elsewhere in Chicago, crime researchers have tackled violence prevention by identifying individuals within criminal social networks. Some studies have shown that violent crimes, such as gang murders, tend to move through networks of people who know one another — like a flu virus being passed between coworkers. “The closer one is to a gunshot victim, the greater the probability of one’s own victimization,” the authors of an influential 2012 study wrote in the Journal of Urban Studies. Based on such contagion theories, medical imager Miles Wernick of the Illinois Institute of Technology helped develop for the Chicago Police Department what's known as the Strategic Subject List. The list, which is created using data on individuals who have been arrested in connection with or convicted of crimes, features the names of hundreds of people deemed likely to experience violence in the future. Police say the list has been highly reliable. Seventy percent of the people shot and 80 percent of those arrested in 2016 were on it. While the algorithm can’t determine whether a person is likely to be a perpetrator or a victim — merely that they are likely to be involved in a crime in some way — Chicago police officers sometimes go out into the community to inform people that they are on the list and under increased surveillance. It's this aspect of predictive policing that has raised eyebrows among civil libertarians, including those with the American Civil Liberties Union. As detailed in a new documentary, Pre-Crime, Chicago police using the Strategic Subject List were dispatched to the home of a local man with no history of serious offenses. The officers told him that the list indicated he was likely to be involved in violent crime and let him know they would be watching him closely. The man protested: “I haven't done nothing that the next kid growing up hadn't done,” he told the Chicago Tribune in 2013. And he isn't the only one who has cried foul. Mattu adds that predictive policing initiatives tend to focus on home break-ins, car theft, and similar crimes while ignoring white-collar offenses like money laundering and fraud. Then there's the question of whether gains brought by predictive policing are sustainable. After the LAPD began using PredPol in 2012, property crimes went down, only to slowly creep back up a few years later. Even as the debate continues over these concerns, some researchers still see great promise for predictive policing.